Driving over a pothole can be more than just a nuisance. Potholes can damage a car's shocks and suspension, or worse, cause a driver to lose control of his or her vehicle. Although most drivers know to avoid potholes, road conditions, such as traffic, sometimes make it impossible to do so. Those who have suffered injuries from auto accidents caused by potholes may be entitled to compensation for their pain and suffering. If you have been injured in an auto accident, it is important to contact an auto accident attorney to learn more about your legal rights. For more information about auto accidents and potholes, contact the White Plains, NY auto accident attorneys of Worby Vecchio Edelman, LLP. Potholes are round depressions that can form in any road, but are most common in areas where water drainage is poor, traffic is heavy, or road maintenance is neglected. These areas are most vulnerable to potholes due to the fact that potholes are primarily formed by water and wear and tear over time. 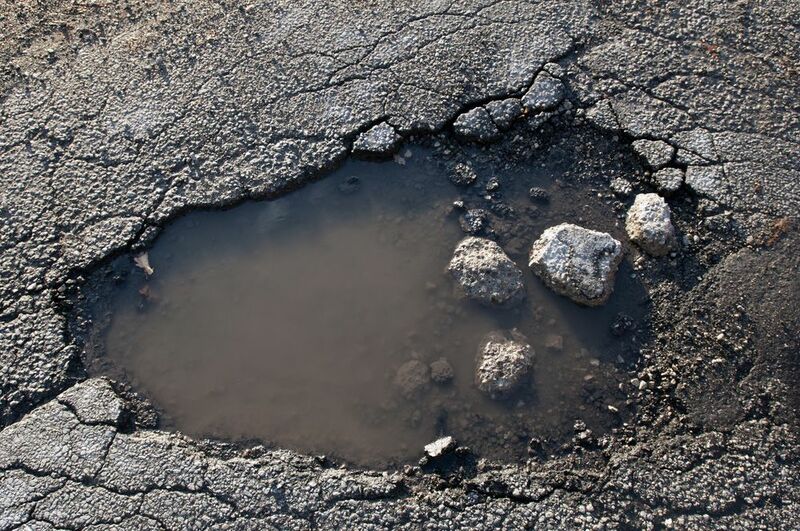 Some other causes of potholes include regular exposure to water freezing and thawing, as well as excessive heat. Once a pothole begins to form, it can become several feet wide, creating a serious road hazard. How Can Driving Over Potholes Cause Accidents? A road with potholes makes for more than a bumpy ride. Potholes can cause damage to vehicles and lead to major accidents with serious injuries. Depending on the depth and size of a pothole, driving over a pothole can result in an impact much like the force of a car accident at 35 miles per hour. Driving over potholes at freeway speeds can be particularly dangerous, sometimes causing a driver to lose control of his or her car. This can result in serious injuries or even fatalities to the driver of the vehicle or others on the road. Perhaps more dangerous than cars and trucks driving over potholes is motorcyclists. When a motorcyclist rides over a pothole, the front wheel may get caught, causing the motorcycle to crash. This can be fatal for the motorcyclist and cause other vehicles in the vicinity to crash. In many situations in which a pothole is determined to be the cause of an auto accident, the entity in charge of maintaining the road where the accident takes place is liable. Entities that may be held responsible for maintaining roadway conditions generally include the city, county, or state. Although government entities are often responsible for maintaining safe road conditions, they may not always be held legally liable for damages sustained as a result of poor conditions. This is because many state laws protect the government by allowing it a reasonable amount of time to both discover and repair road hazards, such as potholes. This means the government entity responsible for maintaining a particular road may not be held legally liable for damages if the road damage was not previously discovered or reported. However, there is an exception that if the pothole or other dangerous road condition was around long enough that the government should have discovered it but did not, the government may be held liable. Because proving liability in auto accident and pothole claims can be complicated, it is important to contact an experienced auto attorney. If you have been injured in an auto accident, you are encouraged to contact the legal team of Worby Vecchio Edelman, LLP.